Hundreds attend funeral of Sergeant Eliyahu Drori on Mt. Herzl shortly before Memorial Day for fallen Israeli soldiers. 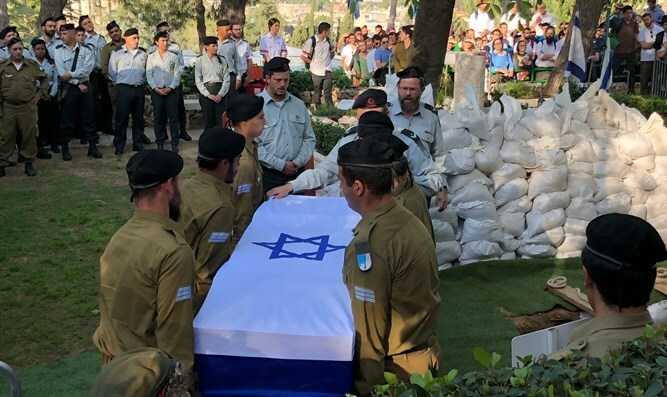 Sergeant Eliyahu Drori, 20, who was killed in an operational accident in the Nitzana area on the weekend, was laid to rest Sunday. The funeral took place at the Mount Herzl military cemetery. Rabbi Michael Yammer, the head of the Sha'alvim hesder yeshiva, where Drori studied, spoke at the funeral. "I remember the first time I met Eliyahu three years ago. You entered the yeshiva and the first sentence you said was - 'I came to build myself in order to understand what my role in the world.'" "I was amazed by your grace, from the inner beauty that was revealed and by how real it all was," Rabbi Yammer continued. "What sensitivity you showed to all, what love, it was important for you to understand yourself, your essence." "Now that you have come to the throne of glory, ask and plead to the Lord of the Universe over the people of Israel, tell of our troubles, that this will be last [grave], ask that your family should have the strength to continue in your footsteps and that we should merit to see the final redemption soon in our days," added the head of the Sha'alvim yeshiva. The commander of the 73rd Battalion, Lt. Col. Elad Tzuri, eulogized Drori and said, "You acted professionally and with initiative, and you worked to reach positions. When you arrived in the company, you were characterized as a commanding, leading and influential warrior, one that connects to everyone and creates a personal connection with everyone." "Your friends talk about your smile smile and courtesy. [You were] a true friend, and your commanders tell of how cool you were and how you helped the commander, you were one of the most precise soldiers." "To he Drori family," added Lt. Col. Tzuri, "I have no words to comfort you at this difficult time. Just two days before Memorial Day for Israel's Fallen Soldiers, you unwillingly joined the great family of bereavement. From now on you are an inseparable part of us and I wish to share your deep grief. Eli, I salute you, warrior. Rest in peace. R est in peace." Drori's father said at the funeral: "Your country, your community, your friends and what's left of your family are here to say good-bye to you. In all the difficulties in your life you have always smiled and I am sure that even now you are smiling." Drori was killed when a shell burst into flames in his tank. Three other soldiers were injured in the accident, two of them severely.